Any best free apps for Mac OS X (macOS Mojave) to install on the new Mac? Beside those built-in default apps, you may need some more for specific purposes. If you're struggling to figure out the best free Mac apps for MacBook Pro/mini/Air/laptop from the thousands of software programs, check this article. Here we list 2016 top best Mac apps free for photo editing, music & video download, game, design, productivity and more. It's a common choice to watch movies or videos on Mac when we're free. Therefore, watching movies on a Mac shouldn't be quaint or inconvenient. If you have QuickTime failure opening certain movies, there we share you the best free Mac apps to play videos on Mac computer. If you're a big movie fan and use mobiles to watch movies a lot, you will need a movie converter that will convert videos/movies among different formats. Here the must-have free app to convert videos on Mac OS X is MacX Video Converter Free, a free DVD converter app for macOS Mojave and earlier. It will free convert among MP4, MKV, AVI, MOV, 3GP all formats in 4K, HD 1080P/720P, SD to fit iPhone XR/Xs/Xs Max, iPad Pro/Air 2/mini 4, Samsung Galaxy S9 edge, Android mobiles fast with excellent quality. Video player is an essential app to install on Mac and when it comes to Mac video player apps, there are many good choices like VLC player, QuickTime player, Cisdem VideoPlayer and many more. 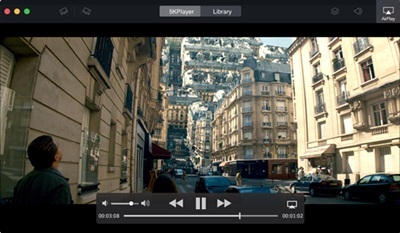 5KPlayer, a fast-rising video player free app for Mac OS X (macOS Mojave incl. ), is simple, light and clean. It professionally handles video and audio in any formats, from SD resolution to HD, 4K UHD and 5K. It also features a video downloader, AirPlay receiver/sender and radio player. If you're tired of those common free Mac player apps, try it. Backup & rip Disney/Hollywood DVDs to MP4 etc on macOS Mojave/Windows 10, remove all DVD protections. Transfer videos, music, photos, ringtone, iBooks etc between iDevices and Mac (macOS Mojave), drag and drop. When it comes to entertainment with Mac, movies are one of the major topics. To this end, two popular free apps working on Mac OS X that help you to get free movies, videos as well as songs are provided. When you want to watch YouTube or online videos when there is no internet connection, the best free YouTube downloader app for Mac OS X (macOS Mojave) will help. MacX YouTube Downloader is a totally free and safe app to download videos on MacBook Air/Pro, iMac etc from YouTube, Dailymotion, Vevo, FaceBook, Vimeo and 1000 more online sites. Any MP4, WebM, FLV in 4K UHD, HD, SD, 3D, 360 vr videos are all supported. It's fast and easy to download YouTube videos to iPhone, iPad, iPod with this app. Almost all users who have the need to rip DVDs will have Handbrake installed on computer. Handbrake is one of the best free app on Mac to convert DVD or Blu-ray discs into MP4, M4V or MKV. The app is simply, fast and will generate excellent quality. However, if you want to rip protected DVDs on Mac computers running on macOS Mojave, you will have to switch to other best free Mac apps for DVD ripping like MacX DVD Ripper Mac Free. If you are a big music lover, music apps will be the must-have software to install on Mac computer. To get free music with good quality, try the free apps on Mac OS X below. 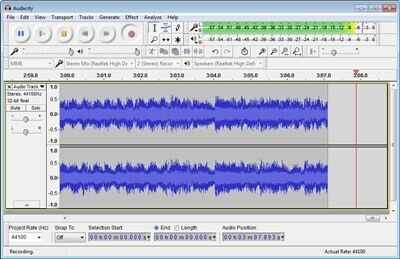 Audacity is an open source free audio editing and recording app for Mac OS X, Windows, Linux and others. With this free app on 2017 MacBook Pro/Air, mini, you can listen to music, record audio from various sources in high quality, edit and mix it, import and export music into WAV, MP3, AIFF and OGG files. Besides that, various of audio editing features are available to edit sounds, add audio effects, mix tracks, cut and paste recording etc. Other best free Mac apps for audio editing include Gtuner, Mixxx, Hydrogen, Reaktor 5 Player etc. If you are looking for the best Mac apps free for music playback, you can try Spotify if you're not using Apple Music. Spotify is a streaming music service that offers you a new way to enjoy millions of songs. Once you sign up a Spotify account, you can listen to music freely on the Spotify app installed on Mac. Spotify offers massive music collection with excellent high quality, as well as a slew of useful features. Similar top free music apps for Mac are Google Play Music, Vox, Tomahawk and also 5KPlayer. With sharing selies on social sites getting popular, how to take the best photos as well as further editing gets more important. Which free photo editing apps for Mac are easy to use while generating the best effects? Check below. When it comes to the best free photo apps for MacBook Pro/Air, mini, iMac, the first thoughts may be Photoshop or iPhoto. 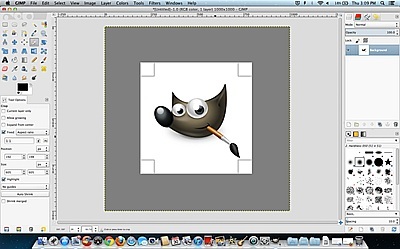 Besides them, there are many other top free Mac apps for photo editing, just like GIMP. Similar to Photoshop, GIMP offers wide range of photo editing tools with which you can make subtle adjustments and colorize, remove barrel distortion, create impressive monochrome conversions, and do everything like Adobe photo app. The best free Mac apps for photo editing also have Affinity Photo, Lightroom, Pixlr, Preview. After we learn the best free photo editing for Mac OS X, the programs to mange photos are also among the sought-after best free photo apps for Mac. JetPhoto Studio is one of the best free apps to mange photos on Mac. It allows users to create flash or web galleries from the photos, send photos to mobile phones, share photos on websites and more. 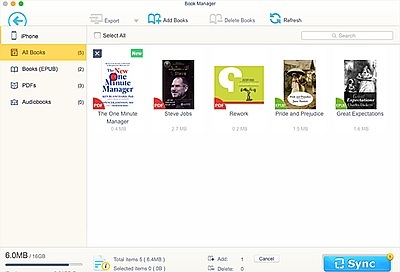 It also features soome image management and editing features. Similar best free Mac photo apps include MacX MediaTrans, Phototheca, XnView MP, IrfanView etc. Do you often play Mac games? Besides those famous games on Mac, you may have missed out some truly greate yet totally free games. We have the best free game apps listed under each category below. When you want a free game app on Mac, there are countless choices. Actually, there are so many categories that it may be hard to choose the best. 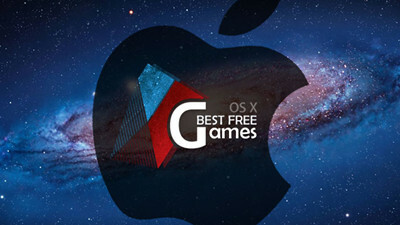 No worry, below we list some top-rated free Mac game apps for you. Best strategy game for Mac: League of Legends, Team Fortress 2, Hearthstone, Starcraft II, Heroes of Newerth. Best free car racing game on Mac: Sonic & SEGA All-Stars Racing, Grid 2, Dirt 3, TOCA Race Driver 3. Free first person shooter game apps for Mac: Marathon Trilogy, Team Fortress 2, Assault Cube, Red Eclipse, Warsow, OpenArena, Cube 2 Sauerbraten, UberStrike. Are you sure you have made a safe copy of your favorite photos, videos, data, apps, memories? Accidents happen all to often. The best free Mac apps below will make sure all your important files are safely kept. 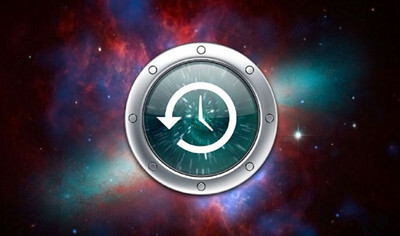 Time Machine is among the top choice for the best free Mac app to backup the computer data. As an inbuilt free Mac data backup app, Time Machine will save hourly backups for the past 24 hours, daily backups for the past month, and weekly backups for data older than a month. Note that Time Machine will delete the oldest backup to make space for new data. So you're suggested to use other free Mac backup apps together. Other best free Mac apps for data backup: FileFort, Backuplist+, CrashPlan, iBackup, SilverKeeper. MacX MediaTrans is a rising data backup app that helps to backup data from iDevices to MacBook Air/Pro, iMac, Mac mini on macOS Mojave and earlier. It excels iTunes or iCloud for its superfast speed and simplicity. By only a drag and drop, data on iPhone, iPad and iPod will be backed up to Macs, including videos, music, photos, ringtone, iBook, Podcast and more. It also features strong iOS (10) file management ability. It offers free version for unlimited time. Similar best Mac apps free for iDevices data backup: iFunBox, CopyTrans Manager, AirMore, Apowersoft Phone Manager, iPhone Explorer. In fact, there are some good free apps that will make your task on Mac faster and more efficient. Nowadays, it's important to stay productive and get your tasks done in less time. You will be amazed at the features of those samll, free but useful apps. 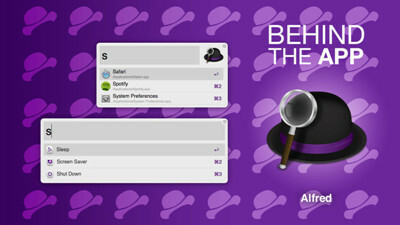 Alfred is a free application launcher app for Mac. It maximizes users' efficiency on Mac by facilitating the access to various programs. This simple and free app makes it fast and easy to launch apps, find files, search web, solve calculations, and do many more with keyboard shortcuts. It will track the app your often use to make you more efficient. Other top free launcher apps for Mac include: Quicksilver, LaunchBar, Spotlight, Butler. Wunderlist is among the best task manager apps for MacBook Pro/Air, iMac that it allows you to make lists. With this free app on Mac, you can create lists of different tasks with deadlines, share them with friends and access from different devices. You won't miss any task, to-dos, due dates or additional information. Other excellent free Mac task manager apps are Any.do, Evernote, Todoist, TickTick. f.lux is a small, free and extremely helpful app that will adjust the color of the monitor based on the time, sunlight and temperature of the day. By adjusting the brightness and color temperature of Mac's display, it helps eyes relax and reduces strain on our retinas. Other best free apps for Mac to protect our eyes include Redshift, RedshiftGUI, Twilight. It's really frustrating to have Mac out of storage space. Getting the right tool will help you clean up more space, check the storage being used, delete unnecessary files and eventually speed up the Mac performance. Dr. Cleaner is the only and also best free app for Mac OS X to optimize memory and clean disk to speed up Mac computers. It will help you to scan the large files to delete, clean whole system, automatically optimize memory, scan junk files, clean disk, delete cache and unnecessary files, empty temporary files, cache files, system files, log files and do more. You will see a significant performance boost with this free app. Everyone is online nowadays. Famous networking apps like YouTube needs no introduction. But you may have missed some tiny and interesting free networking apps for Mac that make it easier to get contact with friends. No doubt that Twitter for Mac is one of the most popular and also top best free Mac apps for social networking. As the official client for Twitter, it allows you to do everything you can on Twitter, for example, you can sign in multiple accounts, read notifications, send messages, check trending topics and hot spots, search contents and more. Similar good free apps for Mac networking: Face Tab, Echofon, Social Lite, FlipToast. If you want to contact friends around the world via video or voice chat, Skype will be your first choice. Skype is a simple and free app for Mac OS X that makes it easy to text messages and make free calls to anyone else on Skype. It's quite stable with excellent video and audio quality. Other free apps for macOS Mojave chatting: Google+ Hangouts, Facetime, VOXOX, Viber, Line, Jitsi. Mac computer has a free email app built-in, but that's not always the best solution for daily mail use. There are third-party free apps for Mac OS X (macOS Mojave) that offers better solution to manage emails. 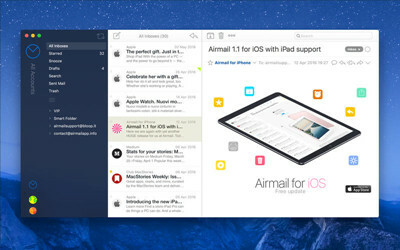 Speaking of the best free mail app for Mac OS X, Airmail will a be must-have app for MacBook Pro/Air, iMac or mini. As the recommended mail app for Mac, Airmail delivers Mac users a quick, modern and easy-to-use experience to read and manage emails. It supports iCloud, MS Exchange, Gmail, Google Apps, IMAP, POP3, Yahoo!, AOL, Outlook.com, Live.com. 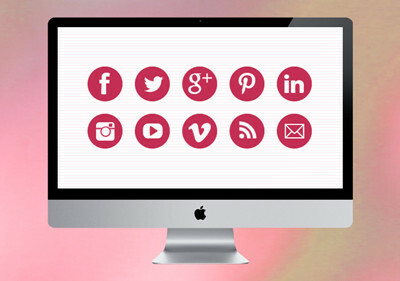 It has advanced features for single and multiple accounts. Good free mail apps for Mac computer: Apple Mail, Polymail, Thunderbird, Inky, CloudMagic.